Players will take turns rolling dice and tallying. Let’s say, for example, one person rolls a 2 and 3, which total 5. She’ll place one candy on that number. 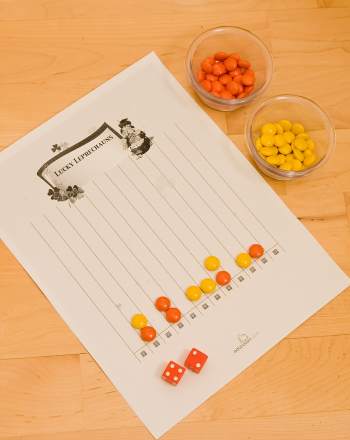 By the “luck” of the roll, you may end up with lots of candies on a particular number, or just a few, right? Before you launch your game fully, have each player take a guess: In 52 rounds, which number will be the luckiest? When the game is over, there will be two ways to win: a “shamrock circle” winner is the one with the most candies on her lucky number. The “pot of gold” prize goes to the person who picked the number with the highest total amount of candy on it at the end. That winner gets to keep all the candies that landed on that number, too (but do feel free to adjust your own regulations!). Feel free to play this game for several rounds, the more the better. Within the first few games, watch carefully: your child should start seeing a pattern which happens to be a classic example of mathematical probability theory! 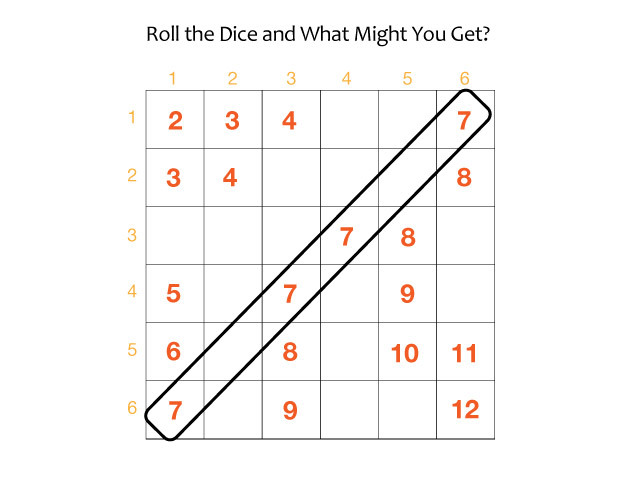 It works like this: when you roll a pair of dice, there are 36 possible combinations, which can be shown in the chart below (note: we’ve left some squares blank. That’s on purpose—have your child fill them in!). And guess what? The most common sum—7 out of 36—is the number 7! 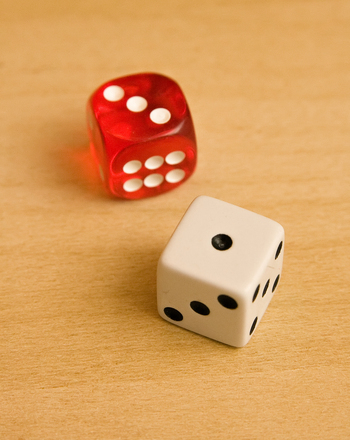 The “probability” of rolling 7 is therefore 7/36--slightly greater than 1/6. So here’s some maths fun for your year six competitor: let the leprechauns teach us a lesson here! If you want the best shot at winning, you can do more than just wish for “luck.” Use your maths mind and follow the concept of probability. Go for that 7 and see what you get!